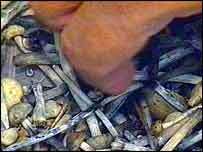 The Conservatives say a loophole in the law allowing the sale of hallucinogenic mushrooms should be closed. Shadow Attorney General Dominic Grieve told BBC London he finds it "extraordinary" that shops and stalls in London are selling them openly. They are sold legally if they are fresh but are a Class A drug if they are prepared, for example, by drying them. Several test cases are in the process of being brought to court, and define what constitutes preparation. The Home Office says it is concerned about their open sale. A spokesman said: "The Home Office has been looking closely at the legal aspects of the situation, particularly in relation to freshly packaged magic mushrooms, and it is the Home Office's view that if they are packaged as a product and offered for sale, they are unlawful." Similar effects to LSD, though shorter, milder "trip"
But Mr Grieve said: "Certainly the law is unclear. Magic mushrooms occur naturally in the environment, therefore attempting to ban them in that sense is impossible. "But there is certainly a loophole because although the law says if you dry them you turn them into a product, and that can also be preparation, it doesn't make clear what will happen if you sell mushrooms in their natural state. "One way of dealing with this is to ban the sale of magic mushrooms. "I do find it fairly extraordinary that people should openly seek to make money from selling it when there are potentially extremely serious side affects from their use, and feel that the can do that in good conscience". Tony Van owns the Amsterdam of London shop on Camden High Street in north London, which sells magic mushrooms. He told BBC London: "The problem is with the law is that it doesn't actually define anything. "It's either preparation or product, so as long as we maintain this freshness and sell it then we are going by the law and we don't have to worry about that." Mr Van says his outlets offer safety advice to those they sell magic mushrooms to, for instance that they should not take other drugs at the same time, drink alcohol, drive, or use them when pregnant or if they suffer from depression. He also says the authorities are sending out mixed messages about magic mushrooms. His shop in Birmingham has been forbidden from selling them by the police but he is still allowed to sell them openly in Camden. A Metropolitan Police spokesman said: "If we receive a complaint about the sale of the fresh mushrooms we would look into it. "We are currently aware of the test cases coming to court which will provide some clarification of the law." 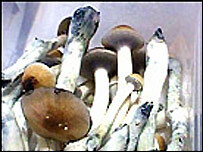 Customs and Excise is also attempting to levy tax on the sale of magic mushrooms at 17.5%.